DOES A CLEAN OFFICE MEAN HAPPY WORKERS? The typical employee spends 40 hours at work per week on average. This is a considerable amount of time spent at the office, and as such, it is paramount that employees have a clean and safe environment in which to work in. Having a clean, hygienic work place is the foundation of a well-run business as it will foster the kind of environment that is conducive to productivity and success. Here are five ways maintaining a tidy office boosts staff happiness. Contracting the service of a professional cleaning company lets your employees know that you value them and their well-being. If employees are forced to work in unsanitary conditions, they will undoubtedly feel as though their need for safety and cleanliness has been neglected or worse disregarded. 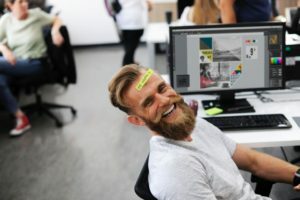 If they sense that their boss does not care about their well-being it can lower staff morale and engender the belief that they too can behave with disregard to their duties. When employees have to work in untidy, cluttered work environments, they are bound to become distracted in a number of ways. Studies have shown that untidiness such as foul scents, severely diminishes concentration. A cluttered office means that workers will have to spend time looking for work material which will lead to frustration. Frustrated employees are more likely to get into arguments with other employees, especially if their tolerance for untidiness is different from theirs. If employees are spending the time to deal with these unnecessary issues, it means they are using less time to do what they are paid to do. Hiring a professional cleaning service to take care of your office sanitation will result in employees using less of their own time cleaning! Not only does making employees carry out cleaning duties at work diminish comradely most importantly it diminishes productivity. To make sure your staff is happy, outsourcing expert cleaners to take care of office cleaning should be on your top priority list. Expecting your workers to take up this responsibility may be viewed as disrespectful and in some eyes, unprofessional. When workers become used to working in unsanitary environments, just the thought of going to work can demotivate them- not to mention when they get there! Nobody likes the site or smell of an un-kept place that’s dusty, dirty and filled with unidentifiable odours. On the other hand, going to a clean workplace is a welcoming sign that management has played their role in creating the ideal environment for their workers to flourish. This will of course, motivate employees by putting them in a productive frame of mind. The first and most important benefit of maintaining a clean work environment is having healthy employees. Shared office spaces are a playground for diseases, so too are employee’s personal desks and computers. Contracting a competent cleaning services to maintain your offices will lessen the likelihood of employees getting sick on the job and lessen the likelihood of business owners having to find thousands of dollars to spend in damage control. Additional, a healthy staff means a productive staff. Unproductive costs. Hiring a professional cleaning company may seem like a costly undertaking at first, however savvy business owners will gravitate towards the benefits. These important benefits will save them the time and money they would have eventually spent dealing with the effects of an unsanitary workplace.